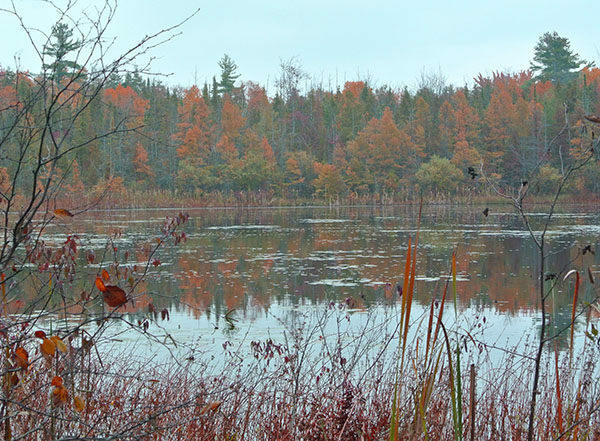 In 1990, Pyatt Lake was destined to become a subdivision, having already been subdivided into 10-acre parcels and approved for septic systems when the newly formed Grand Traverse Regional Land Conservancy made it the focal point of its first attempt in land preservation. Located just off Bowers Harbor in the heart of Old Mission Peninsula, Pyatt Lake represented one of the most botanically diversed, privately-owned properties in the region. At times locals referred to the shallow, boggy body of water as "Traverse City's Walden Pond." At one time Pyatt Lake was actually an arm of Grand Traverse Bay and the sandy ridges crisscrossing the preserve are dunes formed when Lake Michigan receded thousands of years ago. 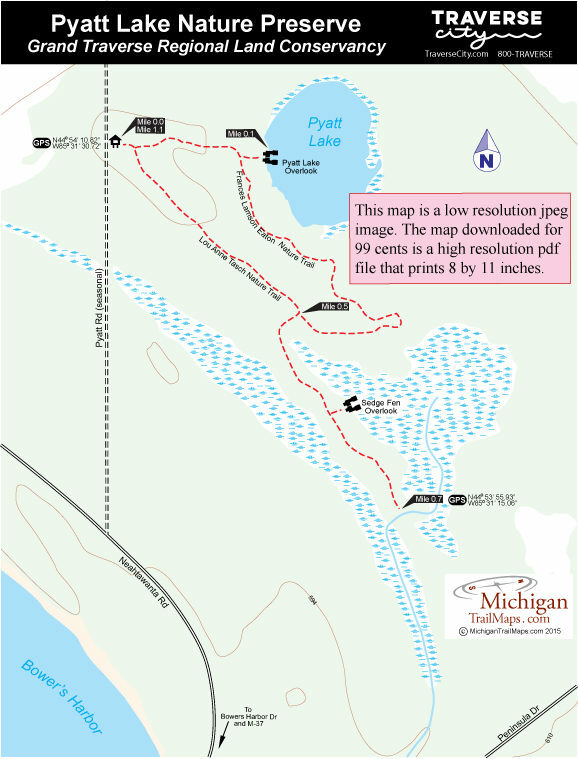 Today Pyatt Lake is regarded as one of only three high quality examples in northern Michigan of a wooded dune and swale complex and the only one in Grand Traverse Country. 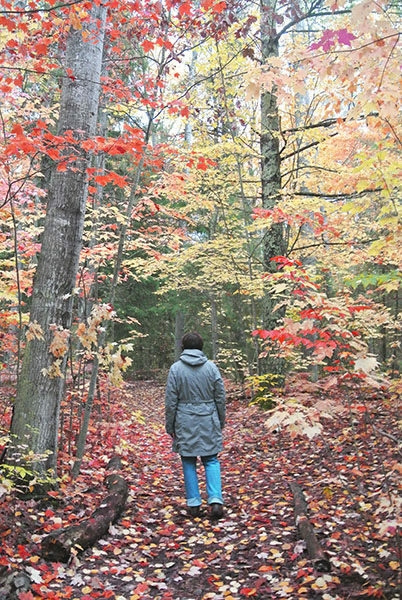 The preserve’s forests, lake and marshy-like meadows called fens are a refuge to more than 250 species of plants, ranging from rattlesnake orchids to old growth hemlocks, and home to barred owls, pileated woodpeckers, blue herons, foxes and muskrats. In the fall migrating waterfowl use the lake as a feeding area; in the spring lady-slipper orchids, trillium and other wildflowers carpet the ground. Pyatt Lake is not the destination for a wild romp down a sand dune, mountain biking or other high energy outdoor activities. The natural area is more of an outdoor classroom, a quiet place to observe and remind ourselves, and more importantly our children, of the incredible biodiversity of wetlands. Following the loop in a clockwise direction, head east (left) at the junction next to the parking area on a foot path that a brass plaque labels as the Frances Lamson Eaton Nature Trail. Within 200 yards you reach the short spur to the observation deck on Pyatt Lake that includes a bench and a view of almost the entire lake. If it’s early in the morning or dusk, you can sit quietly here with hopes of spotting something wild. Backtrack to the main loop as it heads southeast around Pyatt Lake. The path remains in the woods and then makes a sharp swing to the west and at Mile 0.5 arrives at a junction. 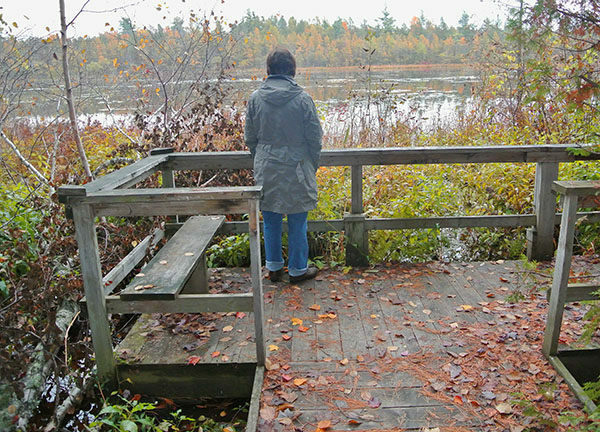 By taking the lefthand fork you will follow a wooded dune and quickly arrive at the preserve’s second observation deck, this one overlooking a sedge fen. This trail continues south, reaching an unbridged stream in 200 yards. Backtrack to the last junction and continue northwest (left) on a segment labeled as Lou Anne Tasch Nature Trail. You pop out at the parking area at Mile 1.1. 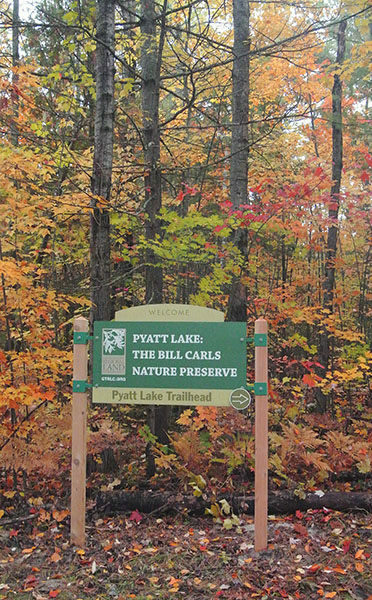 Other than parking and an information kiosk, there are no other facilities at the Pyatt Lake Nature Preserve trailhead. Pyatt Lake Nature Preserve is open year-round but access is via Pyatt Road, a seasonal road that may be difficult to drive in the winter. From US-31 in Traverse City, head north on M-37 and then in less than a mile veer left onto Peninsula Drive. In Bowers Harbor turn left onto Neahtawanta Road and in a quarter mile turn on right on Pyatt Road. The preserve is posted on the east side of the road.